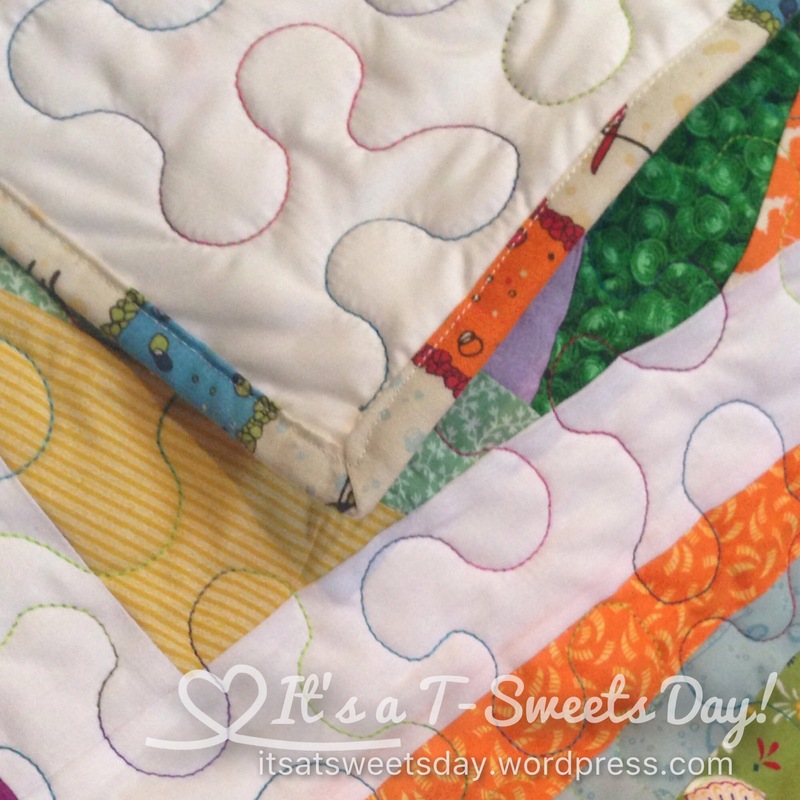 Young Women Value Quilt – It's a T-Sweets day! 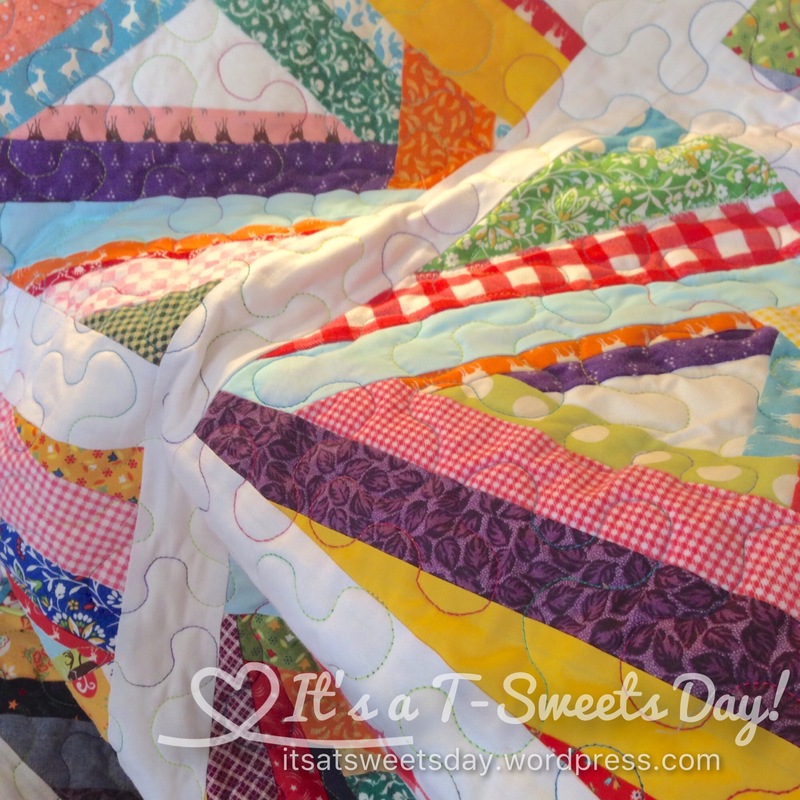 Published on August 22, 2016 August 22, 2016 by Tracy @ It's a T-Sweets Day! Good Memorable Monday morning! 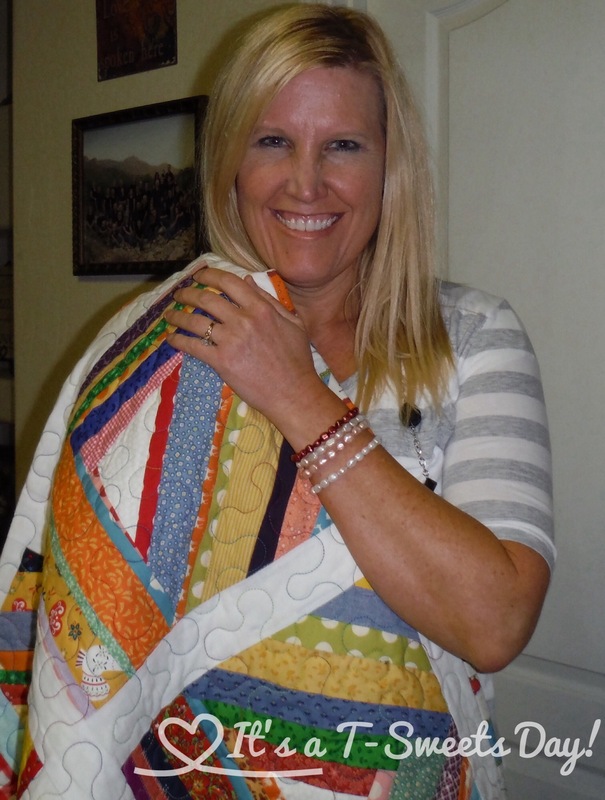 For this week’s Memorable Monday, I am sharing a quilt that I helped 20 young women ages 12-17 make for a leader who served them for many years. I had the girls bring scrap fabrics in the bright value colors that represent the different attributes they would like to acquire i.e.-white=faith. Then I rounded up about 10 sewing machines and had the girls share. While one was sewing, the other was picking out and placing her next fabric. I manned the rotary cutter to save fingers and bandages;). You get me, right? Lol! 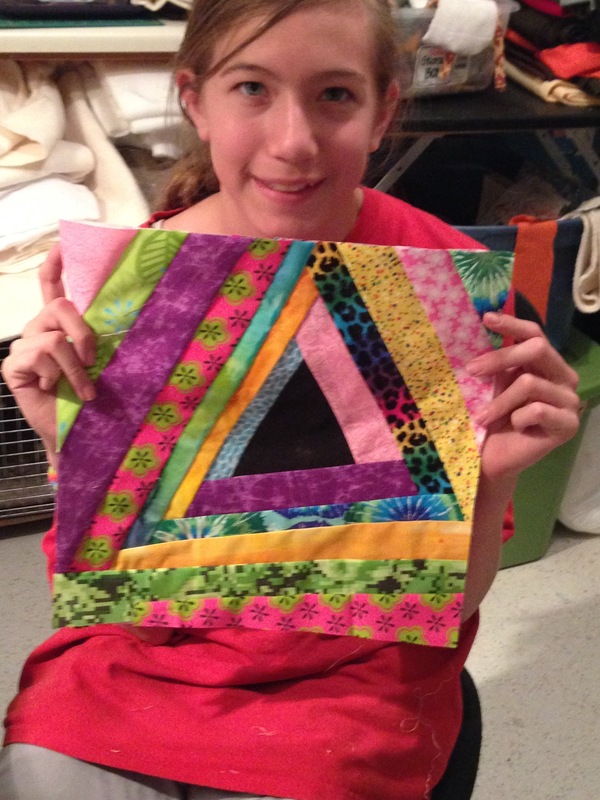 I gave each girl a 14″ muslin square with a wonky triangle already sewed down. They then would pick a fabric, I would cut it into a strip, and they would sew it down to the triangle working around and around getting bigger and bigger with each strip. (I wish I had taken pictures of all the girls working on their blocks, but I was quite busy with the cutting). Here is a picture of my niece making one on her own with a black center. After many trips to the sewing machine, the block would be all covered and I would trim it down to 12.5″. The girls would all smile at this step because the trimming made them all look so pretty and “professional”! All of the blocks were finished in one evening. I took them home and sashed and quilted them into a beautiful quilt. Of course, I used multi colored thread to quilt it. The girls were so proud to present their farewell gift to their long loved leader. She was happy to have such a sweet reminder of the beautiful young women! 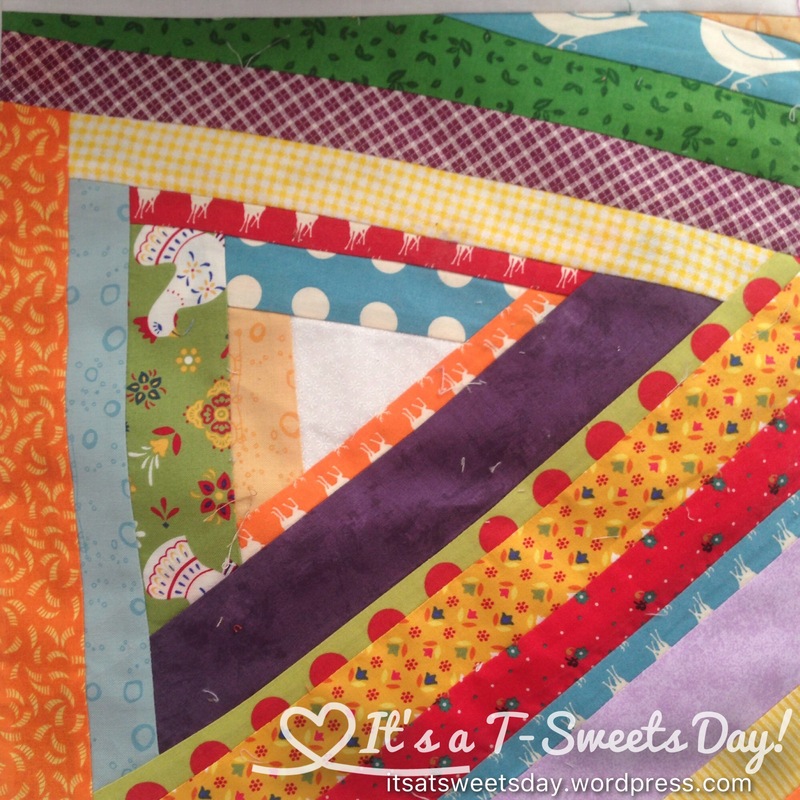 Sew a triangle down to the center of the 14″ squares. Place a strip face down on the triangle matching the edges. Trim the strip a little longer than the triangle on the top and bottom and sew down. Sew around each square to keep strip ends from shifting. There you go! 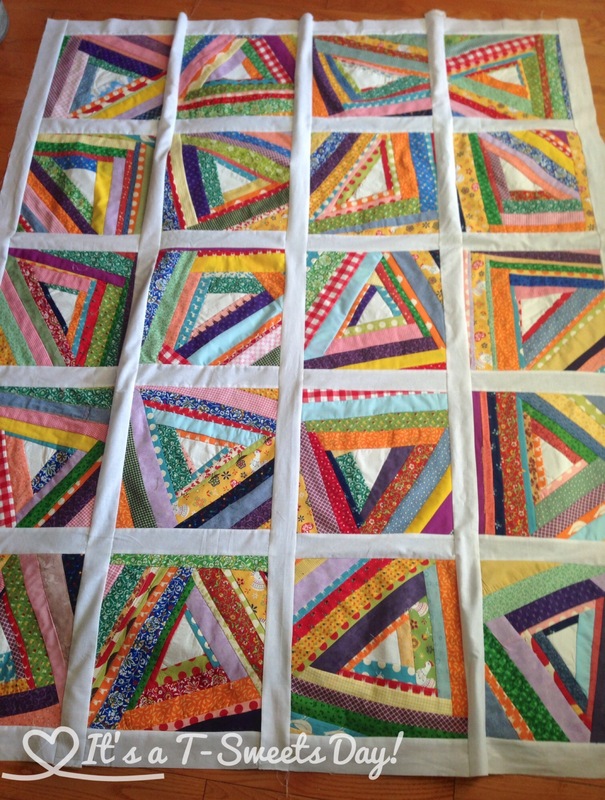 A fun and easy quilt to make on your own, or with a group of friends, or with a bunch of SWEET young women! What a great idea! I bet they had so much fun.